Both Japanese barberry (Berberis thunbergii) and common barberry are invasive plants in North America. Despite this, they are commonly grown as landscape plants and are widely sold at garden centers. However, these and other barberry species are banned on some areas. 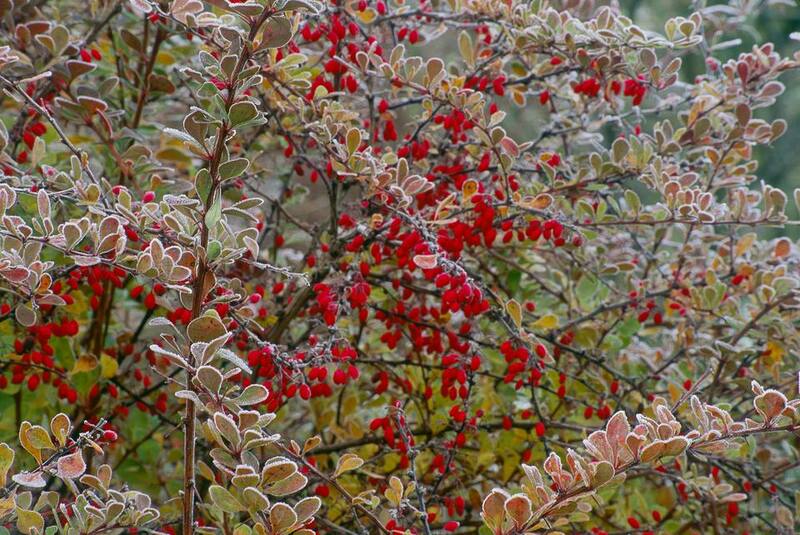 Barberry is prized for its hardiness, easy care, and deer-resistance. If you would like to try it in your own landscape, it may be safest to choose one of the new cultivars of sterile, non-invasive barberry plants, which began hitting the stores in early 2019. "Barberry" and its genus name, Berberis derive from the Arabic name for the fruit, barbaris. Both the plants themselves and the berries they produce can be referred to as "barberries." The species name, thunbergii comes from the name of botanist, Carl Peter Thunberg (1743-1828), a great plant collector who brought Oriental plants back home to the West. Japanese barberry shrubs often reach a height of 6 feet at maturity, with a similar spread, although there are more compact cultivars, such as 'Nana' and 'Compactum.' The bush bears green leaves, as well as yellow flowers that bloom in mid-spring. It also has sharp thorns, and red, oblong berries that last well into the cold-weather months and are thus valued as winter interest features. This bush is considered more of a foliage plant than a flowering shrub, although it does produce blossoms. That said, only some cultivars are worth mentioning as foliage plants (except for in the fall season). These would be the cultivars that bear leaves of a color other than green, including red, gold, and purple. In autumn, even the leaves of the species plant can develop some nice color (often reddish or orange). Whereas both B. thunbergii and B. vulgaris lose their leaves in winter, B. julianae is an evergreen type. It grows 6 to 8 feet tall and 4 to 6 feet wide and is hardy to zone 6. 'Crimson Pygmy,' true to its name on both counts, bears reddish purple foliage and stays short (at most, half the height of the species plant, and usually less, so approximately 2 to 3 feet tall). 'Aurea' is also something of a dwarf, topping out at 3 to 4 feet tall. Its foliage starts out a vibrant yellow. 'Rose Glow' attains the same mature height (6 feet) as the species plant. Its claim to fame is the fact that its leaves have three colors: red and purple streaked with off-white. Native to Eurasia, Japanese barberry shrubs can be grown in USDA plant hardiness zones 4 through 8. Other than requiring a well-drained soil, these shrubs tolerate a wide variety of growing conditions, which helps account for the shrubs' popularity as well as its invasiveness. They also tolerate pollution well and are both shade-tolerant and drought-tolerant shrubs. Despite their tolerance for shade, they will give a better display if grown in an area with full sun. Traditionally, barberry shrubs were used in hedges, where their sharp thorns help to create a "living fence." When planted about 3 feet apart, the shrubs fill in the gaps quickly, forming a wall of foliage. Barberry are also effective for erosion control and are among the most deer-resistant shrubs known. Overall, they have few pest or disease problems. While Berberis thunbergii and related plants are considered to be invasive shrubs in North America, you can still get the same versatility, low maintenance, and deer-resistance with a non-invasive cross. 'Sunjoy Todo' was bred by Dr. Tom Ranney of North Carolina State University. It is much smaller than Japanese barberry, at a height and width of just 18 to 24 inches, and it does best in full sun. This cultivar has purple foliage and yellow-orange flowers. The flowers produce berries, but the berries have no seeds. This makes the plant sterile and therefore non-invasive.